I’m really glad that Ikea have started to do vegan friendly meatballs. However I am also disappointed for two reasons: one, the fact that they didn’t manage to produce a vegan friendly sauce to go with them; and two, I was kind of expecting something more…meaty! I guess I should have guessed that a “veggieball” would contain veg, but the optimistic part of me was hoping for something a little more exciting. I know that many vegans won’t agree with me, since people seem to be divided into those who are repulsed by mock meats and those who love them. 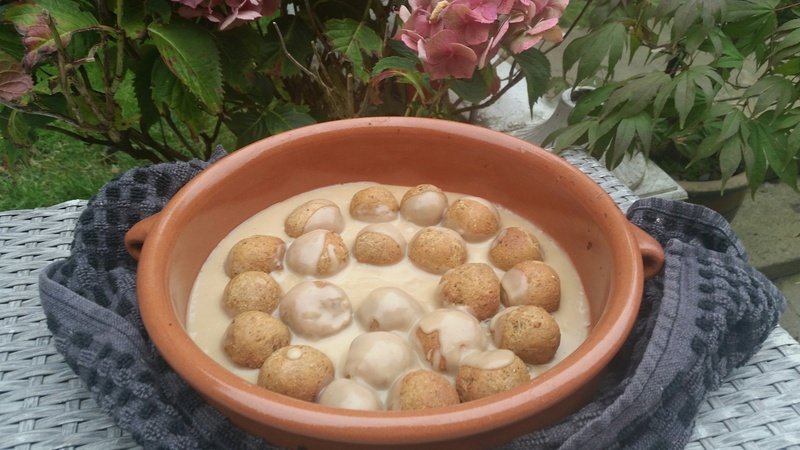 But for those of you who fall into the latter category, here is my* recipe for Ikea-style meatless meatballs and creamless cream sauce! (*I used the non-vegan, original Ikea recipe for guidance). 2 x flax eggs (1 flax egg = 1 tbsp. ground flaxseeds mixed with 3 tbsp. water, leave for 10 mins before use). Enough oil to grease a baking tray. In a large bowl, crumble up the tempeh with your hands before rubbing in the allspice and pepper. Using a wooden spoon, stir in the dairy-free milk, flax eggs, onion, liquid aminos, Worcestershire sauce, and if using, the nutritional yeast and browning. Stir in the breadcrumbs – a mouldable dough should form. Finish combining with your hands. Pull off bits of the dough and roll into ½ inch sized balls using the palms of your hands. Put the gram flour on a plate and roll each meatball around in it until coated. Lay the meatballs on a well-greased tray before shuggling to lightly coat each in the oil. Bake in the oven for around 15 minutes (or until browned and tasty looking). 2 x tsp vegan friendly beef gravy (I used original Bisto – the one in the red tub). Add the stock to a pan and whisk in the flour. Heat up the stock and whisk in the soya sauce, Worcestershire sauce, pepper and salt. Once bubbling, stir in the gravy granules until dissolved. Once the sauce has thickened to the desired consistency, reduce the heat and stir in the soya cream. Continue to heat (without boiling) until the beany taste of the soya cream is gone. 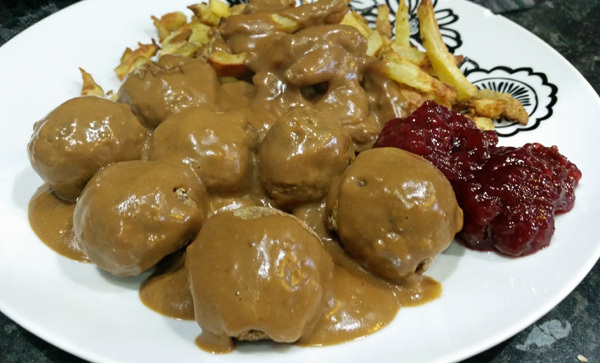 I can’t resist eating mine with oven-baked chips and a good dollop of lingonberry sauce. Although I did promise a Facebook acquaintance that I’d mention that the proper way to eat Ikea style meatless meat balls is with boiled potatoes!